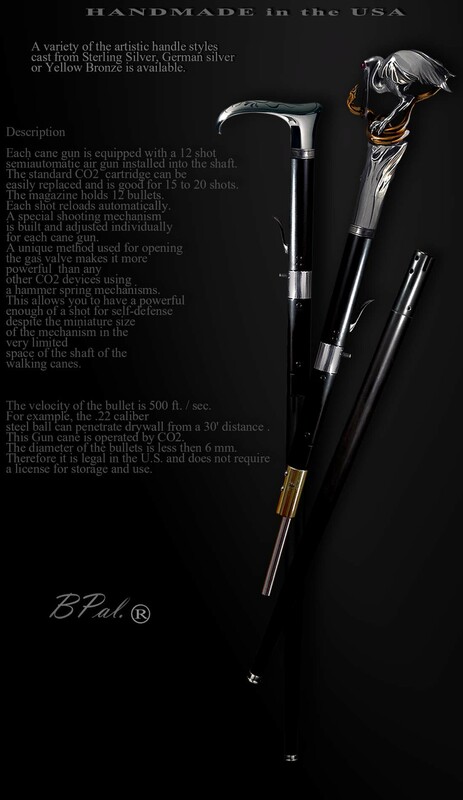 Order a custom air cane gun by Boris Palatnik. All work is handmade and is offered in a wide array of designs & styles. Each cane gun is equipped with a 12 shot semiautomatic air gun installed into the shaft. The standard CO2 cartridge can be easily replaced and is good for 15 to 20 shots. The magazine holds 12 bullets. Each shot reloads automatically. A special shooting mechanism is built and adjusted individually for each cane gun. A unique method used for opening the gas valve makes it more powerful than any other CO2 device using a hammer spring mechanisms. This allows you to have a powerful enough of a shot for self-defense despite the miniature size of the mechanism in the very limited space of the shaft of the walking cane. The velocity of the bullet is 500 ft. / sec. For instance, the .22 caliber steel ball can penetrate drywall from a 30” distance. The cane gun is operated by CO2 and the diameter of the bullet is less than 6 mm, making it legal in the US and does NOT require a license for storage or use.